I have a weakness for scones – often I’ll stop by Whole Foods and indulge in an egg-free scone (or two, I often buy a second for later). This past weekend I had a serious scone craving. Unfortunately, scones are made with heavy cream – definitely not vegan. After an internet search I found a great, simple recipe on food.com, which turned out really well! The recipe called for blueberries, but I used a raspberry, blackberry, and blueberry mix. I hope you try these and enjoy them as much as I have been! Mix dry ingredients, add in softened vegan butter, sugar, and lemon juice and mix. 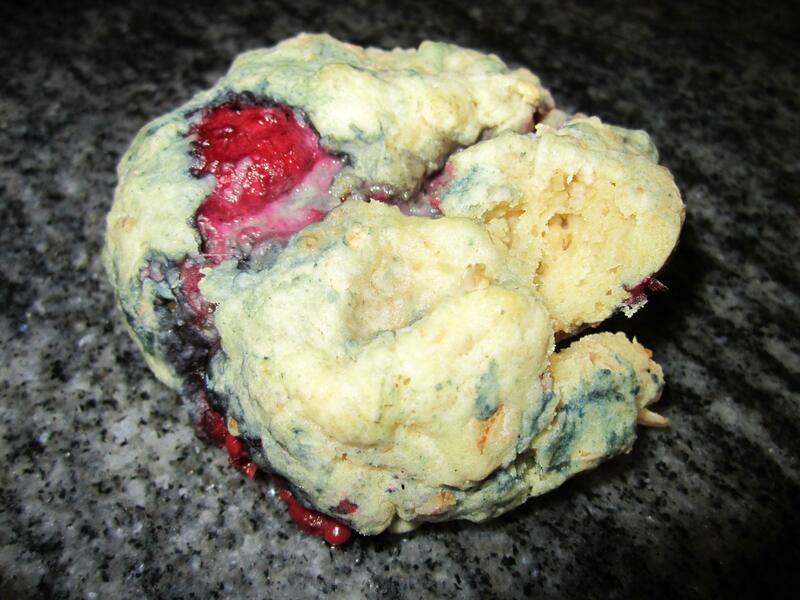 Last, add in the frozen blueberries – don’t over mix as berries will soften and change the colour of the scones to a dull greyish-blue instead of golden. Bake 10-15 minutes until golden brown at 400F. Enjoy!